By John Blair, president of Valley Watch, Inc.
Evansville, IN, December 10, 2010 – Duke Energy always rewards it creepy disgraced executives it seems. A couple of days ago James L. Turner resigned in disgrace after the Indianapolis Star revealed emails between him and his buddy, David Lott Hardy, who was the Chairman of the Indiana Utility Regulator Commission. Those communications may have been illegal as ex parte communications but hey, it is Indiana, where the line between the regulators and the regulated has been ill defined for a long time but especially in the last six years as Mitch Daniels has strategically placed industry leaders in the position of regulating the industries they work for. In Duke’s case, the practice of giving rewards to those who seemingly do some of the worst damage to their Indiana Customers is almost a tradition dating back at least to the massive compensation and retirement benefits offered to then Public Service Indiana Chair and CEO, Hugh Barker, who oversaw the company’s stock crashing in 1984 when construction of the Marble Hill nuclear plant was forced to stop by the exasperated administration of Governor Robert Orr. The Marble Hill case closely mirrors what is happening today with the precarious Edwardsport new coal plant being build near Vincennes in Knox County. In both cases, the Company gathered great political and business support for construction low balling projected cost figures that later turned out to be grossly small compared to final costs. When Marble Hill was first proposed in 1973, the construction costs was estimated at a mere $700 million. By the time we engaged hearing on the matter before the Nuclear Regulatory Commission in 1977, projected costs had risen to $1.4 billion. When construction was halted permanently seven years later, PSI had expended more than $2.7 billion and the plant was estimated to be only 20% complete. With Edwardsport, Duke, PSI’s successor company, announced their plant in 2006 and told Indiana politicians the cost would be $1.2 billion and that the plant would capture and sequester carbon dioxide. But by the time the Utility Regulatory Commission held a public hearing on the matter, the costs had mushroomed to $1.9 billion without carbon capture, let alone sequestration (the US Department of Energy estimates that CCS will cause an additional 50% of capital cost). At the time of the hearing 8/30/07, Valley Watch warned the IURC (see:http://valleywatch.net/wp-content/uploads/docs/Blair.mp3) to carefully control costs or expect the same scenario as Marble Hill in the long run. Since then, Duke has been back before the Commission seeking greater and greater increases in their projected costs, claiming increased materials prices even though most of those prices were in serious decline during most of the ensuing years due to the global recession. As a result, construction costs is now estimated at just under $3 billion without any sort of carbon controls. On December 9, a proposed “settlement” between the Office of Utility Consumer Counselor and Duke was withdrawn. Valley Watch, the Indiana Citizens Action Coalition, the Hoosier Chapter of the Sierra Club and Save the Valley have fought all these increases from the beginning as legal interveners against IURC granting Duke permission to force their customers to assume the total risk of building Duke’s money machine. At no time have the interveners been able to overcome the support of the Governor, the IURC and the Office of Consumer Counselor and Duke ratepayers have had to endure ever increasing costs since the first dollar was spent. At the time of the first and only hearing, Duke asserted that rates would increase a total of 18% overall to build the plant, even though interveners still claim the plant was not needed to meet customer demand. Now with construction fifty percent complete, Duke has already raised rates to that point since they have already spent nearly $2 billion. Of late, Duke is asking the IURC to approve additional ratepayer funding and risk of at least another $1 billion claiming that rates will increase another 16% to complete construction. Also, when the plant was announced and the first hearing held, the plant was supposed to produce 630 megawatts of electricity but was recently revised downward to 618 MW. Duke desires to assume zero risk and force their customers to take the entire risk of their extremely risky venture, the first of its kind at this scale in the world. Interwoven in all this is the advent of scandal regarding the arrogant “revolving door” that has existed under Daniels between Duke and the IURC. Former IURC Chairman, Hardy was a former legal counsel for Public Service Indiana. Daniels fired him when emails, obtained through an open records request by the Indianapolis Star, revealed an extremely cozy relationship between Hardy and Michael Reed, then serving as President of Duke Energy Indiana. Reed was formerly the Executive Director of the IURC. Those emails mostly concerned Duke’s pending employment of Scott Storms as a legal counsel. Storms, however worked as the Chief Administrative Law Judge and Chief Counsel for the IURC. Storms served as Judge, signing orders and determining what evidence was acceptable in the ongoing legal proceedings that Valley Watch and the other groups were seeking protect ratepayers from in this scam. Storms continued to preside over and sign off on legal documents related to the Edwardsport deal well after he had applied to Duke for the private sector job. Daniels’ so-called “Ethics Commission” found nothing wrong with that relationship and gave it its blessing prior to Storms actually accepting the employment. Storms and Reed have both been fired subsequently by Duke as the company desperately seeks to protect Duke Chair and CEO, Jim Rogers by scapegoating lesser employees of the nation’s fourth largest utility. This month, Duke fired James L. Turner, Duke’s second highest executive and former head of Indiana’s Office Of Utility Consumer Counselor, also due to emails that, once revealed, embarrassed the Company by showing the ultra cozy, corruptive relationship he had with former IURC Chair, Hardy. Turner fared better than the others fired by Duke in an effort to save their image and protect their enormous cost overruns at Edwardsport. He was awarded a severance package exceeding $3.8 million. Unfortunately, the Duke/IURC scandal is nearly business as usual in the friendly business/state government environment that exists in Indiana. In October 2006, early in Daniels’ first term, the State’s Department of Natural Resources sought to sell much of one of its prized Fish and Wildlife areas in Daviess County to Peabody Energy for conversion into another southwest Indiana coal mine. Loud citizen outcry forced DNR to withdraw the proposal and the then Director of DNR to later resign. Daniels also appointed Tom Easterly, a long time friend of polluters in the state as his Commissioner of the Indiana Department of Environment Management, the agency that oversees federal and state environmental law. Easterly’s tenure in that office has been marked by the closing of six metro offices that helped issue permits and oversaw their own limited territories as well as the closure of IDEM’s Office of Compliance and Enforcement. Earlier this year, because pressure was mounting on Easterly due to that scandal, Daniels appointed David Joest to Assistant Commissioner of IDEM’s Office of Legal Counsel and Criminal Investigations. Joest is a former legal counsel for Peabody Energy. Joest recently objected to the USEPA’s requirement that IDEM follow federal law in issuing permits for coal mining operations in southwest Indiana by claiming that a statue passed by the Indiana legislature trumped federal law on the matter. Thus, Joest claimed that Indiana does not have to follow the federal Clean Water Act when it comes to his fromer employer. 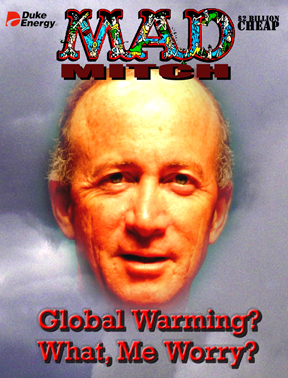 As the scandal at IURC unfolds and more scapegoats are determined, it is almost certain that Indiana Governor Mitch Daniels will do his best to keep the buck from stopping at his desk since he is contemplating a run for President of the United States. Daniels, who gained the nickname, “The Blade” from George W. Bush for his incessant desire to cut spending on the environment and other regulatory areas, recently wrote a Wall Street op/ed suggesting that companies should be able to essentially write their own permits until they get caught breaking laws. Of course, he failed to mention that IDEM would serve as his model since it completely eliminated its environmental enforcement branch in 2009. Daniels, who wears his “conservative” credentials on his sleeve is also going to have to explain why he proposed and signed into law one of the most socialistic measures in US historyin 2008. In that, Daniels approved that the State of Indiana become the sole customer for a pet project that is supposed to produce synthetic gas from coal in Rockport, IN. In that package, The Indiana Finance Authority is slated to buy all the output from Daniels’ pet project and then force Indiana gas utilities to buy it from the Finance Authority at prices that could easily exceed 300% of the price of natural gas on the private market. Daniels has called the arrangement a “hedge” against price fluctuations. It is uncertain how Daniels will rationalize such liberal tendencies when it comes to his corporate cronies while at the same time disguising himself as an ultra conservative who will say and do anything to pander to the likes of right wing tea baggers as he attempts to raise his stature with those folks. As one CourierPress reader recently noted his monthly utility payment increased to the point that it was greater than his monthly mortgage payment for the first time in his life (he is 79). This article helps explain why.